Pack size: 1 x 30ml bottle. Keeping lenses clean of dirt and debris is one of the most fundamental tasks that lens wearers face, and it can be hard work. 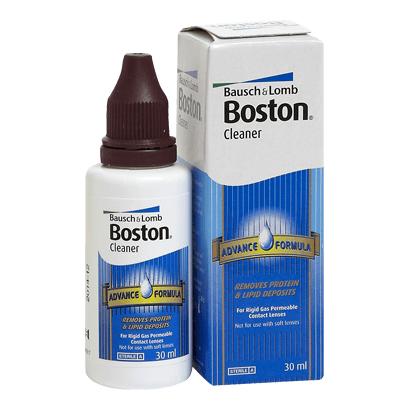 With Boston Advance Cleaner from Bausch and Lomb, it is easier than ever to keep gas permeable lenses clean and functional. Simple to use and utterly effective, the Boston Advance Cleaner will keep lenses clearer, for longer. • The Boston Advance Cleaner has been designed to be part one of a two-step cleaning process. Part two uses the Boston Conditioning Solution, but the Advance Cleaner can be used as a standalone product. • Uses a clever tint in the cleaning solution so that when you are applying the solution to your lenses, you can make sure that every single square millimetre of the surface has been cleaned. • Use in conjunction with a suitable disinfectant solution for safe and effective lens wearing. • Also available in extra value form as part of the Boston Multipack. • In standalone form, the Boston Advance Cleaner comes in one 30ml bottle with full instructions within its easy to store package. Cleanliness is vital in keeping contact lenses bright and pure. Every day, proteins, fats and other particles of dirt collect on the lens, causing vision to deteriorate and risking infection. This handy cleaner will keep lenses safe to wear for longer.